A prolific, popular writer takes on everything from the 1940s to E. L. Doctorow to blogging. 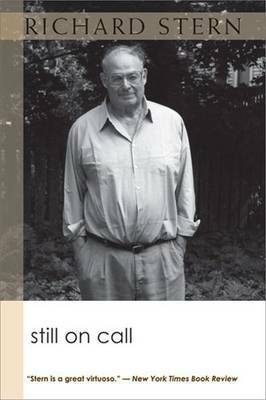 ""Still on Call"" is the sixth and final collection of critically acclaimed novelist and educator Richard Stern. 'Orderly miscellany' is the author's term for this aggregation of reflections, essays, reviews, reportage, commentary, and observations on writing and fellow writers, life, and contemporary culture. The collection's three sections, Coasting, Posting, and Hosting, contain pieces that range from reflections on becoming a writer in the 1940s to assessments of such major writers and close colleagues as E. L. Doctorow, Saul Below, and Donald Justice to topical offerings from Stern's popular blog for the New Republic. This wide-ranging collection is intended as the culmination of sixty years of the writing life but, first and foremost, as provocative entertainment. Stern is a prolific writer, and this selection of some of his highest-quality writing both educates and enthralls. Philip Roth gives this assessment of ""Still on Call"": 'Stern's new miscellany reveals a literary mind of the first order, thinking in elegant prose about dozens of interesting subjects'. "In his 20th book, Stern . . . delights readers with his erudition, honesty, humility, and wit and demonstrates that even in his late seventies, he is 'still on call.' Stern clearly succeeds in his desire to 'stimulate a high level of mental energy' -- put this book on your list of essential reads."